As a person who loves a sleek, minimalist contemporary design (you’ll see a lot of these if you check out my company Pinterest account) the one level design does an excellent job breaking down the barriers between spaces in a bathroom. This is helpful because bathroom spaces are usually small and one larger room can create a sense of room, comfort and style. In one design my remodeling business (Cleveland Design and Remodeling) installed the owners Robin and Pat Baranack specifically chose a one level shower because they wanted to create the clean design of a hip hotel room they stayed in while vacationing in San Diego California. 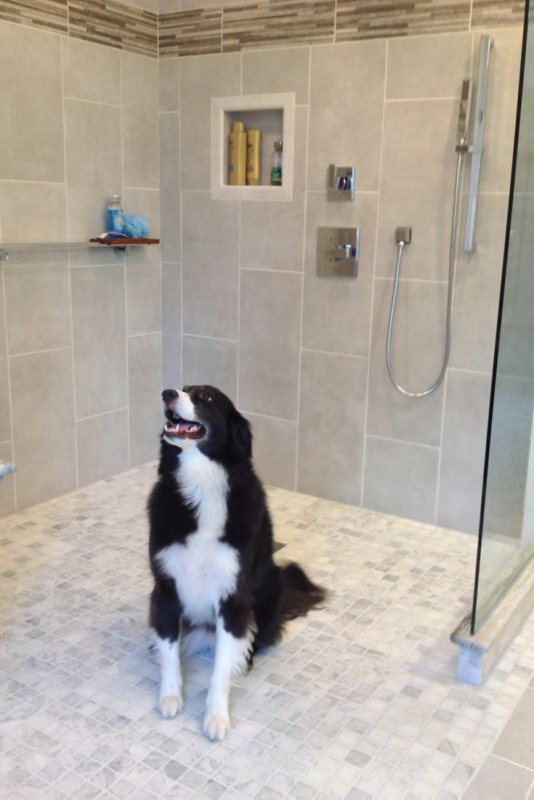 You can see from the picture below even their dog Lucy loves the shower! I will grant you creating a one level shower in a small bathroom takes more planning than picking up a standard fiberglass pan at your local home center store. With that being said a wet room (also called a one level curbless shower) is not as mystifying as contractors make it out to be. They key is to have the right system so you’re not going through a major ordeal cutting joists and dropping the height of your subfloor. The simplest way our company has found to make a wet room one level shower in a small space is to use a shower base former and waterproofing kit. The base former comes in sizes as small as 32” x 32” to accommodate very small showers. 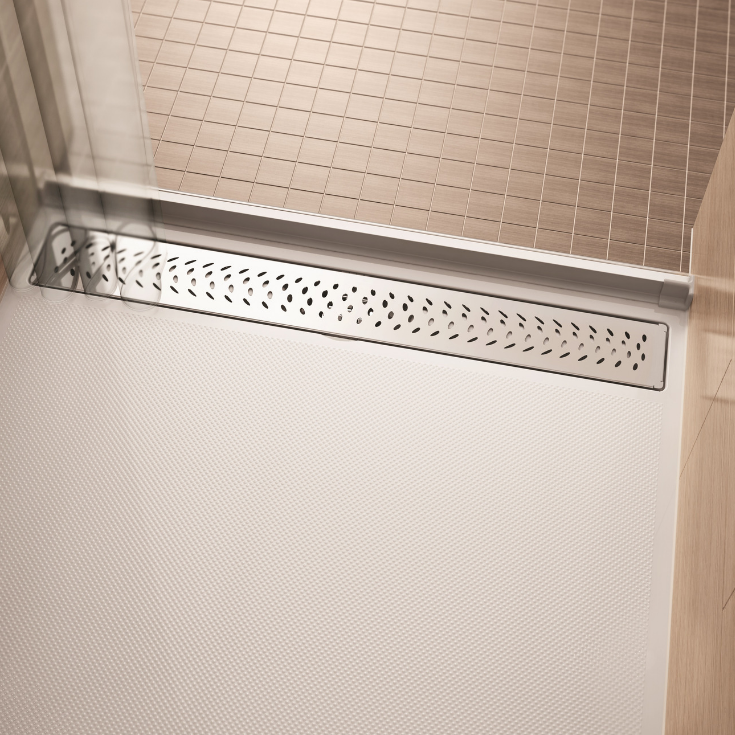 As Adam Droesller (National Sales Manager of ARC Inc. a supplier of these systems) says, “Actually one of the top features of curbless showers is the fact they open up the bathroom by 20-25% vs. designing with a curb.” You’ll see these designs everyone in Europe and Asia where space is tight. In the United States – we’re finally beginning to catch up. Some people love the design aesthetic of a clean-looking doorless walk in shower, but others are passionate about having a door to keep the showering space warmer – especially during the cold winter months (and we have a few of those where I live in Ohio). You’re question might be, “Can I have the best of both worlds?” The answer is yes. For a luxurious one level shower choose either a frameless glass enclosure or a shower screen (also called a shower shield). You’ll stay warm and it’s easy to get into. While this may be true there is research you can do which can provide you with a list of potential contractors who are knowledgeable and skilled at this work. The power of the Internet can help you be victorious over crotchety old-school contractors in your town. First I’d recommend going to the National Association of Home Builders web site and look for contractors with a CAPS designation (this stands for Certified Aging in Place Specialist). Yes I personally have this CAPS certification but I have to admit I hate the name because as a 58 year old guy I have no plans to “age in place!” People with this designation have deepened their knowledge in topics like curbless showers and universal and accessible design approaches. If you can get a local expert in this product – get them. If you can’t, find an experienced roll in shower supplier who can help you contractor get their arms around this type of installation when they are a ‘newbie.’ These suppliers may have systems like the one level wet room systems with shower base formers or one level acrylic pans with linear drains (like you can see in the images below). This in project job was installed by Cleveland Design and Remodeling (a CAPS) contractor in the Cleveland suburb of Broadview Heights. Another recommendation to get this project done right from my good friend Rosemarie Rossetti (a nationally known speaker on universal and accessible design and owner of the Universal Design Living Laboratory) is, “Installers need to watch the manufacturers’ videos and read the instructions on curbless showers. If my husband, Mark can do it, a seasoned contractor can certainly make it happen.” I would have to tell Rosemarie – don’t cut Mark short though – ha! ha! As the need (healthcare advances are helping us to live longer – but not always age as gracefully as we might like) and desire (one level bathrooms provide a sleek contemporary look which is a hot trend in bath remodeling today) the products have grown consistently with demand. Here’s one option – the shower base former I discussed in Myth 2. 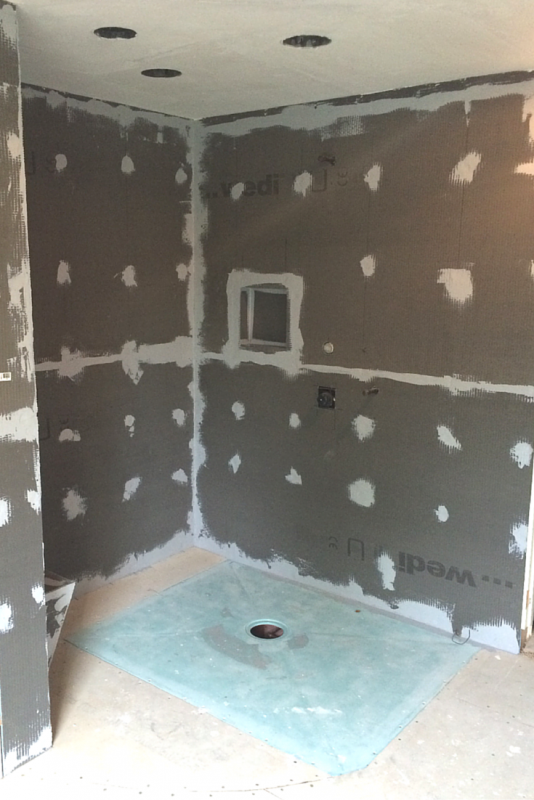 A second option is an expanded polystyrene ready for tile shower pan. 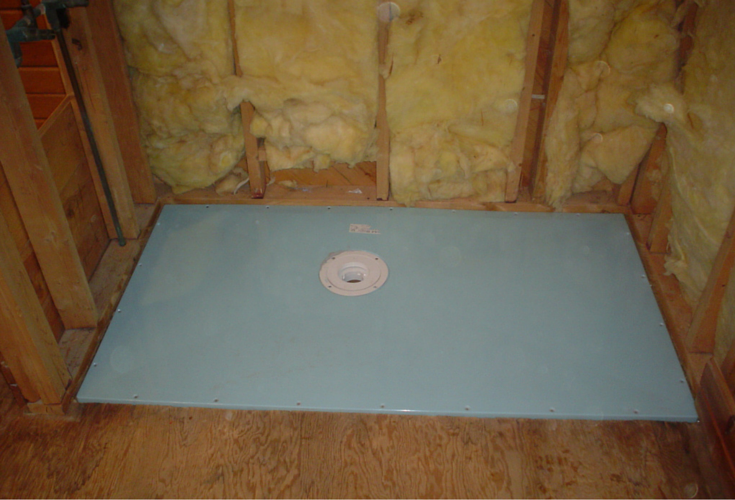 With this pan you simply place it on your subfloor and then tile over it and you have a barrier free shower. Definitely not true! If you use a wet room system – where you waterproof the entire bathroom floor – you can create a spa-like environment like something out of the Jetsons cartoon from the 70’s and spray yourself into the next galaxy. Like something out of the Jetsons! In many ways I think it is easier to create a more elaborate tile design with an open shower because the bathroom and shower are one “continuous” space without having to “enclose” the shower. Check out this design below – does it look simple to you? I love how the tile patterns flows through the room. This hot design is not compartmentalized by separate spaces in the room. 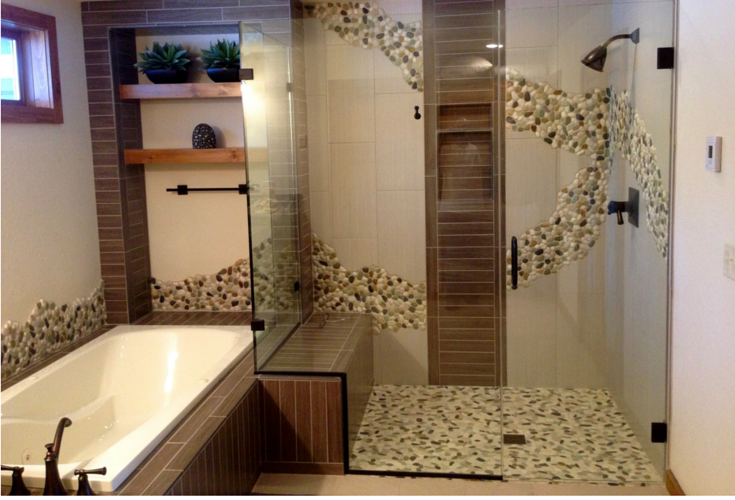 The pebble tile shower and bathroom wall design demands to be seen! Did this article dispel any of the myths you had about a one level shower? Please comment or call one of the numbers below for additional input or a quote on products for a one level shower. I love hearing your comments and questions! 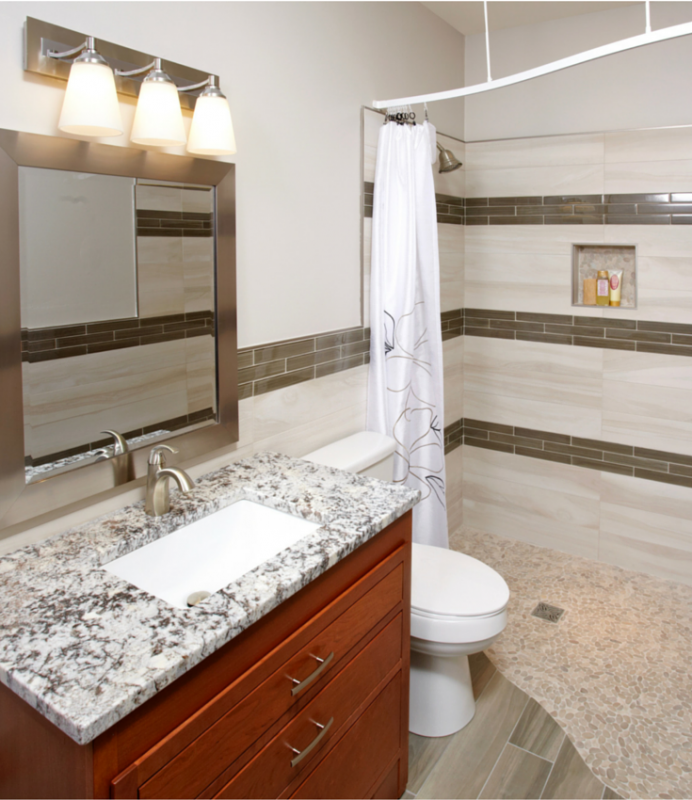 For nationwide supply of one level showers, accessible acrylic shower pans or cultured marble bases and other unique bathroom products call Innovate Building Solutions (877-668-5888). For regional installation service from Certified Aging in Place Specialists (CAPS) contact The Bath Doctor in Cleveland (216-531-6085) or Columbus (614-252-7294). Thanks for reading this article. I am a passionate (that’s a nice word for over the top at times) remodeling and national construction supply entrepreneur who loves learning and writing about remodeling, design and bathroom project. If you’re a Twitter fan follow me @Mike_Foti and my company @InnovateBuild. I am currently renovating the master bath in my 2nd floor condo. Everything is now gutted and the concrete shower floor is level with the main floor. I wanted curbless, my contractor says there has to be a curb due to FL bldg code. I would appreciate feedback on materials or procedures available to achieve as small a curb as possible. Sam – it certainly makes sense to have a seal on the bottom of a hinged door. This seal should sweep along the floor when the door is opened. I read your on line article about barrier free showers. I want to install a 4 foot by 4.5 foot shower in the corner; so there will only be 2 walls. The other 2 sides will be shower curtains. Can I use a LINEAR drain with only 2 walls? My understanding is that the drain must be 2″ minimum below the shower entry. 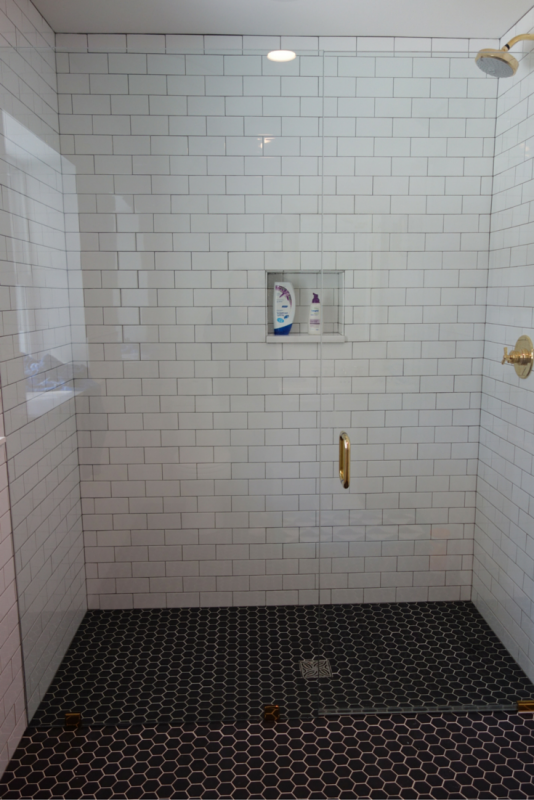 If the shower is 48″ deep, that would require a slope of 1/2″ per foot- which is too steep for a shower. Am I missing something. Planning to remodel shower with a 0 threshold 44″ wide. Planning two opposed swinging doors each of 22″ for maximum accessibility. It is less expensive to buy 72″ high doors than custom taller doors. Could I mount the doors say 6″ off the floor? Barbara – curbless showers are still pretty new to people in the United States – although we all of us living longer (thanks to modern medicine) there are more people needing them than ever before. Let me know if I can help you on a future project. Thanks for your kind words! I only wished I could have seen your article prior to renovating my tiny bath only second bathroom. No one in my small town knew what a curbless shower was until I showed th m pictures. I have a frameless sliding glass door enclosure and it rocks! Love my curbless shower in my 125 yr old house and everyone oohs and awes about it. The small bath looks so much larger for it. Thank you for your excellent article! Thank you so much for this article! I visited Sweden in 2006 and the little vacation home I stayed in had a curbless shower. It was in a corner and the doors were rounded and opened to be along the walls. When they were open you had a lot more room in the tiny bathroom. You only had to close then when you actually took a shower. I didn’t know this was called a curbless shower. I have tried to explain this to numerous people and no one ever understood what I wanted to do to my bathroom. This article will definitely help. Now if I could just find doors like those….. I have a roman tub adjoining a walk in shower that I want to convert to a combined shower area. It is on slab with tile floor in place. Can you assist with this combined layout? Mary – you do not have to have a tile shower to do a walk in shower. The key with a walk in shower is having enough room for it and having a shower system which keeps the water inside. It’s nice in smaller walk in showers to either have a pivoting door or a curved glass (or glass block) shower wall which directs the water back towards the drain. Thanks for your excellent question! Mike 877-668-5888. I have a 10′ x 5.5′ shower in my new construction home. We are going to be dried in next week so we are meeting with the tile guy about the bathroom tile and shower tiles. He is telling me there is no way to do a curbless shower without dropping the subfloor. All of the linear drains he shows me sit on top of the subfloor so he is telling the the shower floor must be at least 2 inches above the bathroom floor to achieve any drainage. I am so frustrated, he uses schulter systems , I am going to show him this s”wetroom stuff and see if I can get him to use it. THanks for the article and links! I want to remove a fiberglass tub with shower upstairs with a walk in shower with glass door. Can you use a glass door on a fiberglass walk in shower or do you have to use tile walk in shower? My shower is long and narrow, approximately 38” x 98”. I want two benches and a curbless entry. Great article!! I am “only” 43 and have a hot tub in my yard, I am ripping out the dumb tub….does anyone use a tub anymore?, and going to hopefully add a small curbless shower. I will do some research with CAPS certified like you suggested! Yay! I am excited to get this going. Thank you for a great article that well easy to understand for the person who “is not a contractor” I have a very small upstairs bathroom currently with a small neo angle shower, after reading you article I’m thinking this might just be perfect for our remodel 🙂 Thanks again. Great article, thank you! Looking to have one installed and the CAPS designation is very helpful..
Erica – we have not used your product but you could certainly feel free to follow up with me. We are seeing a lot of growth one level bathrooms and showers. Mike, have you used the VIM Products Level Entry Shower System™? If not, I highly recommend getting in touch with us to learn more. We have developed a versatile Level Entry Shower System with a 10-Year Warranty. 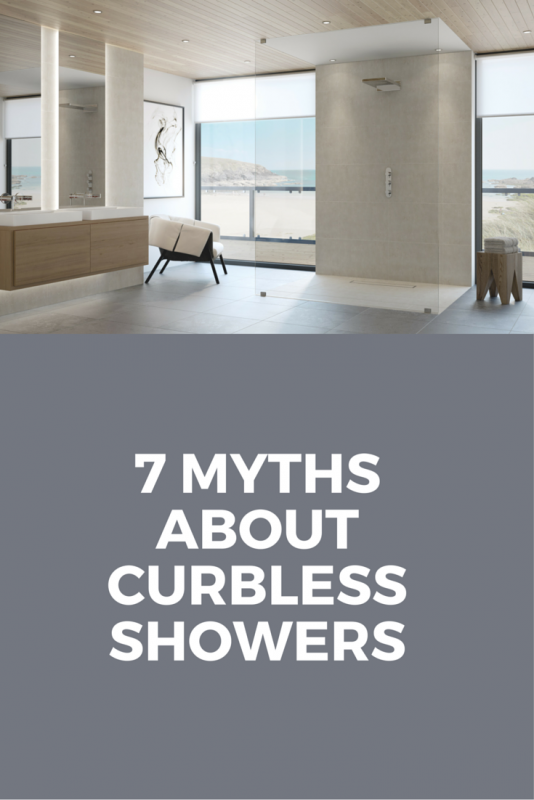 Most importantly, our system does not require you to cut into existing floor supports and offers superior waterproofing than other curbless shower products on the market. Our kit includes just about everything you will need for the job and the pan itself comes in two sizes but can also be cut to custom sizes. I would love to share more information with you if you are interested! I look forward to hearing from you! Jack – our company can do just the shower (or provide the one level barrier free shower pan and waterproofing kit). Give us a call and we can discuss your project in greater detail. Mike I have a 32 X 48 opening in my shower. My wife has MS so I am wanting to replace this shower for a curbless one. I am pretty handy but not sure I can handle the pan project. 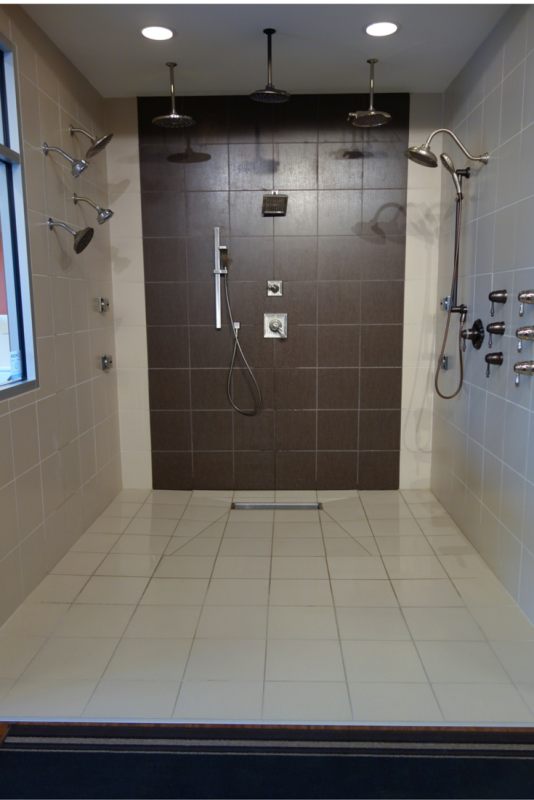 The shower is just a standard shower with fiber glass pan and glass doors. The tile has came loose because the builder did not use concrete board behind the standard tile. I want to replace it all. Can you find a person to just do the shower? I can redo the rest. I seem to be having trouble finding that person. Tara – I’m glad you found this article of use for your grandmothers home! Let us know if we can help you further with any products or installation advice. I love that you can use a smaller bathroom to accommodate a curbless shower. My grandmother recently was wheelchair bound and we’re planning on making improvements to her home to make it more accessible and we were scratching our heads about the shower situation because her bathrooms are all fairly small. I love the picture that you gave of the small bathroom – that is such a creative (but beautiful) use of floor space. Thanks for dispelling that myth!